George Graham Reviews Maddy Prior's "Flesh & Blood"
The English folk-rock style has been around since the latter 1960s when three groups achieved popularity: Fairport Convention, Steeleye Span and the Pentangle. The style never became as popular in this country as other parts of the British invasion of the day, but the music and the performers making it have been remarkably durable. Although their existence has not been entirely continuous, all three groups are still around in one form or another, with at least some original personnel. Periodically there is a flurry of releases by some of the genre's artists, and we now seem are in one such period, with recent albums by June Tabor, John Martyn, Martin Simpson, guitarist John Renbourn of the Pentangle, a first-time release of a 1977 concert recording by the late Sandy Denny of Fairport Convention and albums last year by Fairport founder Richard Thompson, and a new album by Steeleye Span. This week we have another record by an artist familiar to fans of English folk, Maddy Prior. Her new release is called Flesh & Blood. The three pioneering English folk bands all had at their center the distinctive vocals of their respective female lead singers: the evocative and smoky alto of Fairport's Sandy Denny, the haunting soprano of the Pentangle's Jacqui McShee and the clarion, but often melancholy vocals of Steeleye Span's Maddy Prior, whose range was somewhere between that of Denny and McShee. Though she was not with any of those groups, June Tabor is another singer whose vocals helped to define the sound, with one musical foot in misty medieval castles, and the other in rock. Ms. Prior has not been very active, releasing albums infrequently. She did perform with Steeleye Span over a quarter century, but left the reconstituted band a while back, and has occasionally appeared with a group called The Carnival Band. About four years ago, Ms. Prior released her first solo recording in many years, one entitled Year which was something of a concept album on which the most prominent accompaniment was the electronic keyboards of Nick Holland. Now Ms. Prior is out with Flesh & Blood, which is in many ways a sequel to Year. It again features Holland and his synthesizers, and again has a lengthy suite of songs that are woven into a kind of concept piece. As before, the album is an interesting mix of traditional songs -- of the big three English folk bands Steeleye Span most frequently used traditional material -- with some original songs, mostly written by Ms. Prior with Steeleye Span co-founder Rick Kemp, who interestingly does not appear on the record. In addition to the keyboards of Nick Holland, the other principal accompanist is multi-instrumentalist Troy Donockley who plays everything from conventional guitar to Uillean bagpipes to cittern. Drums and percussion are provided by Terl Bryant. Through it all, Ms. Prior's voice is the focus, and she is in exceptionally good farm, delivering her the songs in her ageless style that evokes ancient images while sounding surprisingly contemporary with the electronic instrumentation and some songs even showing a bit of pop influence. The album is arranged with a series of six individual songs -- most adaptations of traditional folk songs, followed by the lengthy suite called Dramatis Personae, which is comprised of seven original pieces which overlap slightly. Maddy Prior's new release Flesh & Blood, her first album under her own name in four years, shows that the long-time voice of Steeleye Span is in fine form. But this album is a departure from the guitar based sound of Steeleye. Flesh & Blood follows in the footsteps of her 1994 album Year in having accompaniment dominated by the electronic keyboards of Nick Holland, whose playing is generally quite tasteful. But about two thirds of the way through the album, one really gets to wishing Holland had played a real grand piano instead of the electronic instrument which at times can sound cheesy, especially in the presence of Ms. Prior's timeless-sounding vocals. However, the addition of more folk-oriented instruments like Irish bagpipes pennywhistle and cittern, which is like a large mandolin, provides an interesting contrast with the electronic sounds. The material, for the most part is first rate, especially the traditional songs that were unearthed for this record, then given sometimes unexpected treatments. Sonically, the album brings few complaints from me, except for the desire for more acoustic instrumentation. Ms. Prior's vocals are especially well-recorded, and there's a decent, though not exemplary dynamic range. 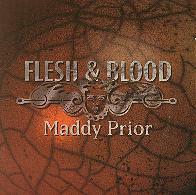 The English folk scene, an obscure offshoot of the 1960s British invasion continues, and Maddy Prior's Flesh & Blood shows that it is in excellent shape.